The restaurant has been around for many years (it was already a well-established restaurant when the OH brought me there in 2009) and is still going strong today. 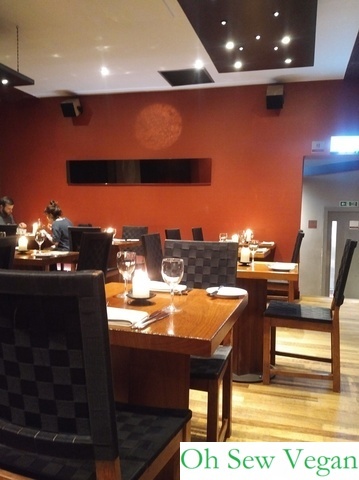 The restaurant itself has minimalist decor and the deep aubergine-coloured walls gives the space a warm and inviting atmosphere. All dishes are vegetarian and are clearly marked where vegan and/or gluten-free. It’s always an exciting experience when you get to choose from more than just one dish on the menu! There are lots of lovely dishes for each course to choose from, but I know from past experience that dishes can be quite filling, right from starter to main course, so I didn’t want to order something too filling and ended up sharing homemade hummus and bread with tomato chutney with the OH (although the smoked and marinated tofu and the Thai fritter of broccoli and marinated tofu sounded lovely too). The serving of hummus was very generous and the dip was indeed very moreish. 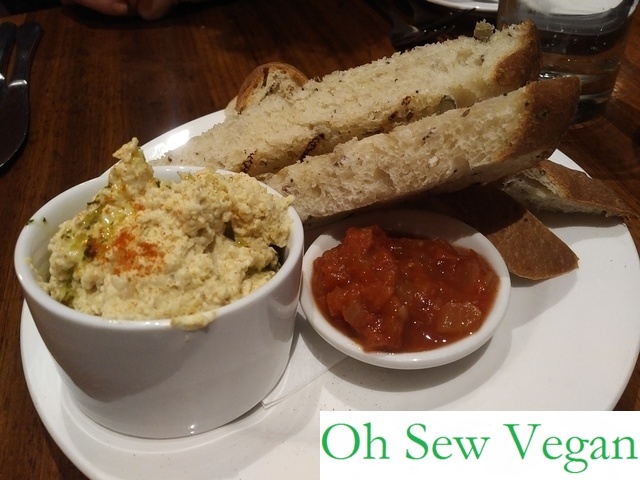 The chutney was fresh and reminded me of fresh salsa but complemented the hummus nicely on a warm slice of soft, homemade bread. Both the OH and I enjoyed slathering on a thick layer of the chickpea concoction and there was hardly any left after we wiped the ramekin clean with our slices of bread. 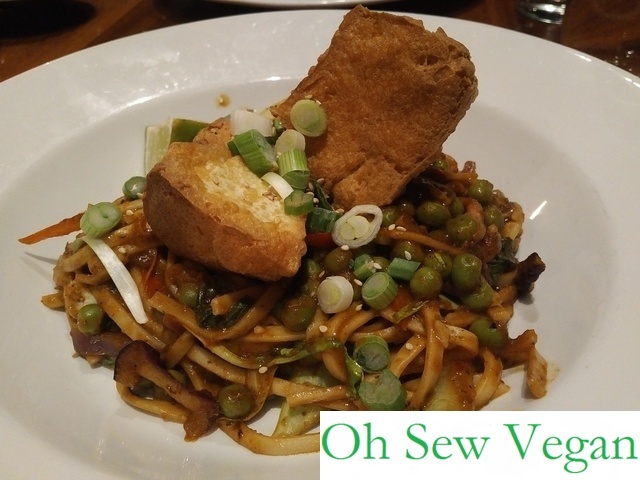 I love a good stir fry and this dish of wheat noodles with fried smoked tofu was a delicious and filling meal. It was quite fitting, I felt, to have a Chinese-style main course on Chinese New Year, although I was a bit disappointed when my dish arrived to see that the wheat noodles described as udon noodles weren’t the same thick white noodles I’m used to. Nevertheless, the noodles were very tasty and it wasn’t too spicy at all. The crispy skin on the smoked tofu was a great contrast to the body of the firm tofu and everything complemented each other very nicely. 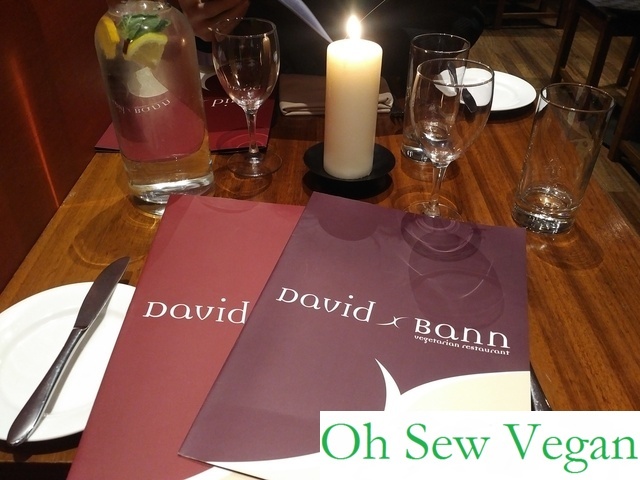 David Bann is a great sit-down restaurant where you can feel comfortable chatting in an upscale-environment without feeling like you can’t drop crumbs on the table or need to use your cutlery in the right order. 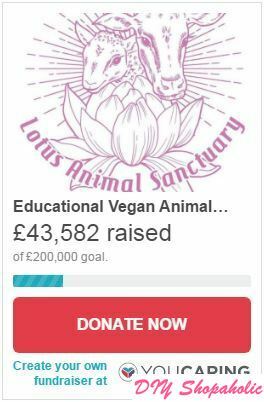 We do like to come for special occasions or when we’ve got company, but compared to some restaurants that offer vegetarian and vegan dishes, the prices here are also very reasonable for a very central location. 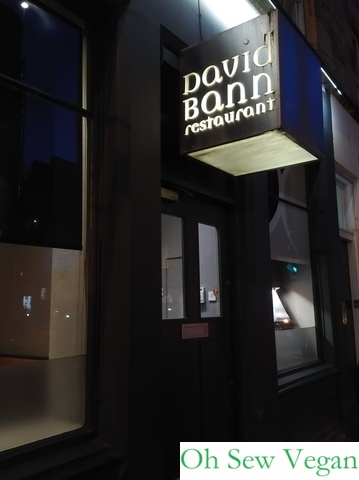 David Bann can be found at 56-58 St. Mary’s Street, EH1 1SX. The restaurant is open from lunchtime at 12:00pm Monday to Friday (11:00am on Saturday and Sunday) and close at 10:00pm (10:30pm on Friday and Saturday). To make a reservation, call 0131 556 5888 or use their contact form (not for on the day bookings) with any enquiries here.